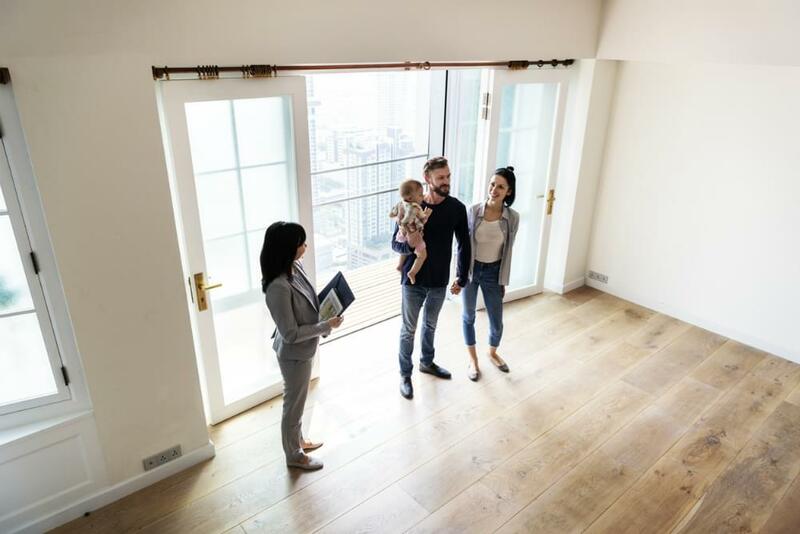 After experiencing the surge in house prices over the last five years, owning your own home in Australia has become a difficult feat to achieve for many. And even though 2018 saw a substantial cooling in the property market, house prices still remain considerably high, with the proportion of those choosing to rent continuing to rise. 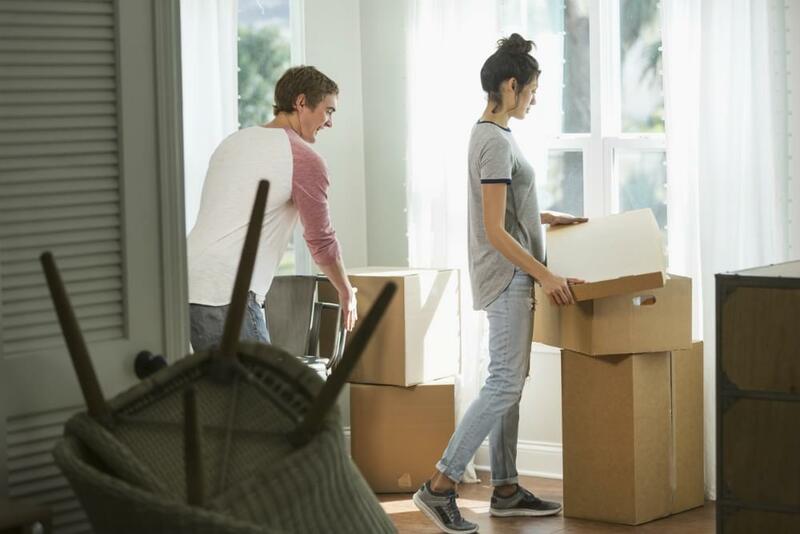 A survey by The Salvation Army commissioned by Roy Morgan last year revealed that more than half of our country’s adult population believes that the great Australian dream of owning a house is over. Could this be true? Has owning your own house in Australia truly become unachievable? "Could this be true? Has owning your own house in Australia truly become unachievable?" To answer this, we calculated the average salary needed for a single individual to sustainably afford a house in each Australian state through data from the Australian Bureau of Statistics combined with the Westpac Mortgage Calculator. The results are based on a 30 year mortgage at the current Australian Standard Variable Rate of 5.05%, excluding the 20% deposit. What is mortgage stress? And which Australian states are worse off? Mortgage stress refers to when a homeowner is required to pay over 30% of their income towards repayments on their home loan. According to research commissioned by Roy Morgan in 2018, nearly one million mortgage holders in Australia are experiencing mortgage stress. Of course, the level of stress under which each person experiences will differ, but when taking a look at the general trends, it's obvious that each state suffers a certain average amount. So what degree of stress are we talking about and which states are worse off? How much of our income is going into mortgage repayments? 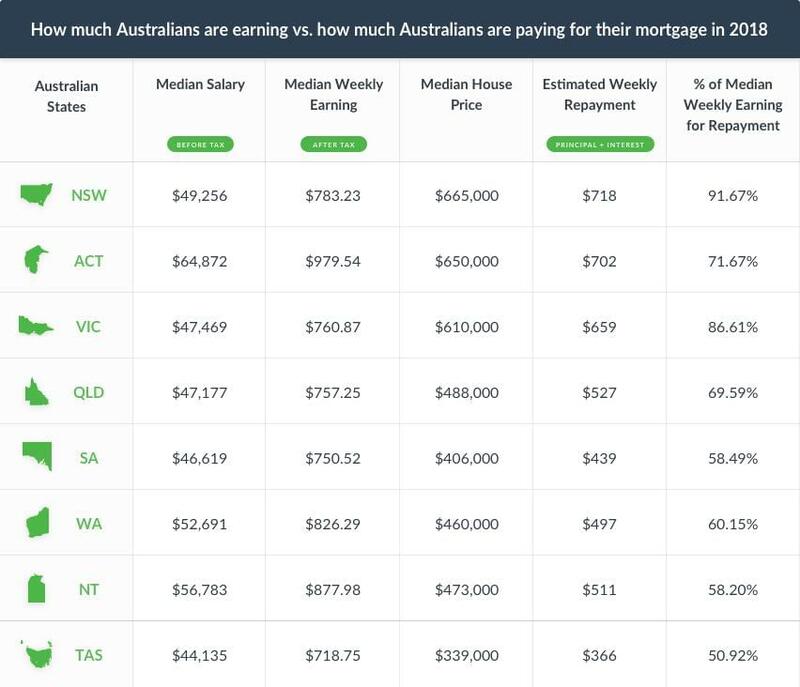 Looking at this table, you can see out of all the states, Tasmania has the lowest estimated weekly repayments of $366 for a median house with a value of $339,000. If you earn the median weekly earning of $718.75 - from a median taxable salary of $44,135 - mortgage repayments would account for approximately 50.92% of your weekly pay. Trailing behind Tasmania is the Northern Territory, where the median house valued at $473,000 will require weekly mortgage repayments of $511. On the median taxable salary of $56,783, this repayment will account for 58.20% of your weekly earnings. South Australia follows fairly closely with $439 to be paid weekly for a mortgage on a house valued at $406,000. This translates to roughly 58.49% of the state’s median weekly earning going towards mortgage repayment. Going up the ladder, repayments for the median $460,000 house in Western Australia will require estimated weekly instalments of $497. Against WA’s median weekly earning of $826.29, this will account for 60.15% of your income. Queenslanders have got it a little tougher, with required weekly repayments of $527 for a median $488,000 house, which would account for almost 70% of the median weekly earning. 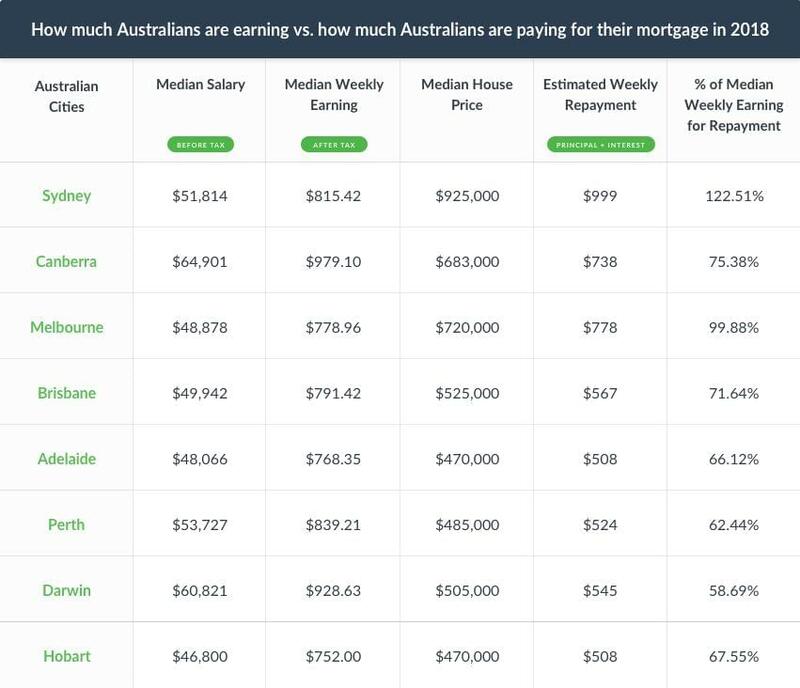 Rounding up in the top three states with the highest percentage of median weekly earning for mortgage repayments is ACT, with weekly repayments of $702 needed for a median $650,000 house. Against the median weekly earning of $979.54, this will account for 71.67% of your income. The second spot goes to Victoria, with the median $610,000 house requiring weekly mortgage repayments of $659. This translates to a contribution of 86.61% of the state’s median weekly earning. And no surprise here, NSW tops the chart with the highest median house price of all 8 states at $665,000! For the average joe, this requires repayments of roughly $718 per week. To pay it off, it would require a whopping 91.67% of a single individual’s weekly earning of $783.23. Gauging off of the previous figures, it’s no wonder Australians are under mortgage stress and the nation's property market sentiment has been dropping! Each state clearly has an average income to repayment percentage of over 30%! In fact, when looking at the data, it's plain to see that even the lowest percentage of income to repayment is still over a mammoth 50%. "In fact, when looking at the data, it's plain to see that even the lowest percentage of income to repayment is still over a mammoth 50%." So then what kind of salaries would we need for each state's repayment to be on the 30% fence? Using the previous information, we calculated the minimum taxable salary needed in each state for single individuals to sustainably purchase a house and avoid mortgage stress. Take a look at how each state fares. Tasmanians require the lowest salary of $63,440, which is $19,305 above from their current median salary. South Australia requires the second lowest salary at $76,093 - a difference of $29,474 from their current median salary. 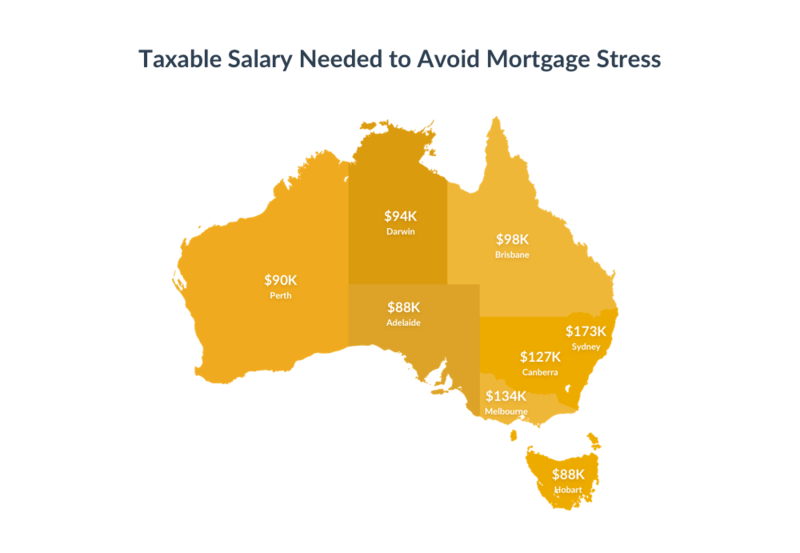 In order to avoid mortgage stress, those in Western Australia are required to earn $86,147. The current salary is $33,456 below this figure. Those in Northern Territory need to have a taxable salary of at least $88,573. This is $31,790 more than what the current median salary is. Queenslanders need to be raking in $44,170 more than what they are currently earning to sustainably purchase a house single-handedly. This translates to a salary of $91,347. Victoria brings in the top three states requiring the highest salary to avoid mortgage stress at $114,227. This is $66,758 more than their current average! At $121,680, the state with the second highest salary needed to sustainably purchase a house single-handedly is ACT. Compared to the current median salary, this is a step up worth $56,808! Taking the top spot, NSW has the highest ideal taxable salary at $124,453. Against the current median salary, this is an additional whopping $75,197! When living in Australia, it’s generally known that the cost of living in a capital city is higher than that of a regional area’s. This holds true with all of the capital cities recording higher percentages of median weekly earning for repayment than their respective state’s. 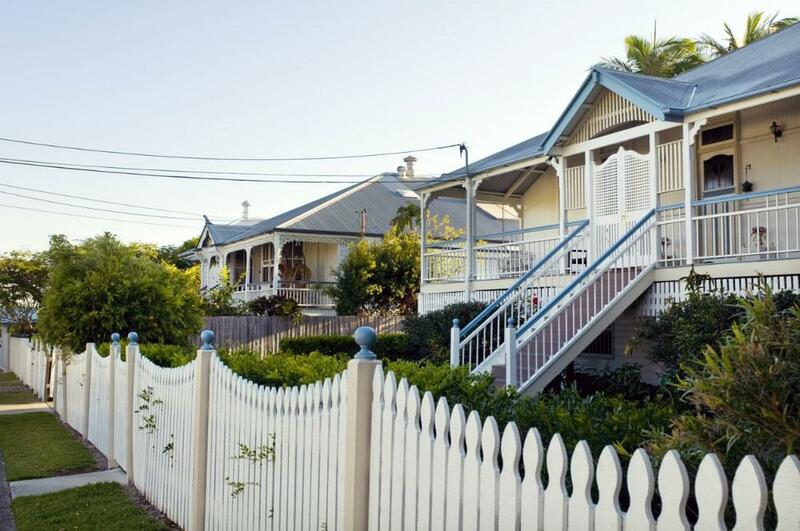 The median price of a house in Darwin currently stands at $505,000. After paying the deposit, a mortgage of $404,000 will require weekly repayments of $545. Compared to Northern Terriotry’s estimated repayment, this is $34 higher. For those on a median salary of $60,821 - earning roughly around $929 every week - mortgage repayments will account for 58.69% of your income. This is 0.49% higher than the estimated weekly repayments for the state. In Perth, purchasing a median $485,000 house will set you back approximately $524 a week for repayments. This on the city’s median $53,727 salary will account for 62.44% of your weekly earnings - working out to be 2.29% higher than that of the state’s. Going down to Adelaide, weekly repayments of $508 are required for a $470,000 house. Here, mortgage installments would account for approximately 66.12% of the median weekly earning of $768.35. This is an increase of 7.63% of the state’s percentage of weekly earning for mortgage repayments. In order to afford the Hobart median house valued at $470,000, $508 is needed each week for mortgage repayments. If you earn the median salary of $46,800, mortgage repayments would account for 67.55% of your earnings. This is 16.63% more than the rest of the state. When looking at the median house price in Brisbane, the median $525,000 house will require a mortgage of $420,000 and weekly repayments of $567. This is $40 more than the estimated weekly repayments for the state, and against the median weekly earning of $791.42, each payment will account for 71.64% of the paycheck. Rounding up in the top three is Canberra, with a median home of $683,000 requiring estimated weekly mortgage repayments of $738. For those earning $979.10 per week, these repayments account for a little over ¾ of your income at 75.38%. Compared to the rest of the state, this figure is an increase of 3.71%. Coming in second place, the median house price in Melbourne currently stands at $720,000. For a $576,000 mortgage, weekly repayments of $778 is required to pay off the house. Against the median weekly earning of $778.96, this recurring payment will amount to 99.88% of a single individual’s income. For Sydneysiders, a mortgage on the median $925,000 house will require weekly payments of $999. This works out to be a whopping increase of $281 in repayments in comparison to the rest of NSW each week! And if you earn the median Sydney salary (which is only $2,558 more than the state) and earn the median weekly paycheck of $815.42, repayments work out to be more than a single individual’s income! Clearly conveyed across the data, and supported by Demographia’s International Housing Affordability Survey 2018, Australia’s property market remains severely unaffordable for single individuals in all the major markets - especially Sydney and Melbourne. 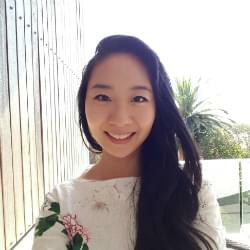 "Australia's property market remains severely unaffordable for single individuals in all the major markets - especially Sydney and Melbourne." Despite the fact that the market has cooled significantly and house prices are currently falling at the fastest rate in 35 years, market prices relative to income are still more than double the rate of the early 1980s. How much do you need to earn in each capital city to avoid mortgage stress? Given the figures above, it’s pretty clear that in order to sustainably purchase a house and avoid mortgage stress for a single individual, paychecks heftier than the current median salaries across all capital cities are needed. But the question is, what kind of numbers are we talking about? Hobart and Adelaide are tied as capital cities that require the lowest salary to avoid mortgage stress, setting the bar at $88,053. While this figure may be the smallest across the nation, it still requires an additional $41,253 and $39,987 respectively to the both cities’ current median salary to reach this. Those in Perth require a salary of $90,827 - that’s $37,100 more than their current median salary. In order to avoid mortgage stress, those in Darwin require $33,646 more than their current median salary. This works out to be $94,467 annually! Those in Brisbane require net weekly earnings of $1890 each week. This accumulates to a taxable median salary of $98,280. Canberra ranks third on the list, requiring a median salary of $127,920 for individuals to avoid mortgage stress. This is $63,019 above their current median salary. In order to sustainably purchase a house in Melbourne, the median salary needed is $85,946 more than the current median salary, taking up figures to $134,834. No surprise here, Sydney has once again topped the charts with the highest taxable salary of $173,160 needed for single individuals to avoid mortgage stress. This unreal figure calls for an additional $121,346 to be added onto the current median salary. What does this mean for Australians and the state of the property market? From the data, it’s clear that New South Wales and Victoria are the two states that had the highest earning to repayment ratio, while Tasmania had the lowest. Among the capital cities, Sydney and Melbourne topped the list with the highest earning to repayment ratio, while Darwin had the lowest. With the estimated weekly repayments for a mortgage amounting to more than 30% of an individual’s median weekly income across all states and capital cities, it’s clear that it would take a minimum of two separate individual incomes to sustainably purchase a house in Australia. Have a read of what the pros and cons of property co-ownership are in this next article.